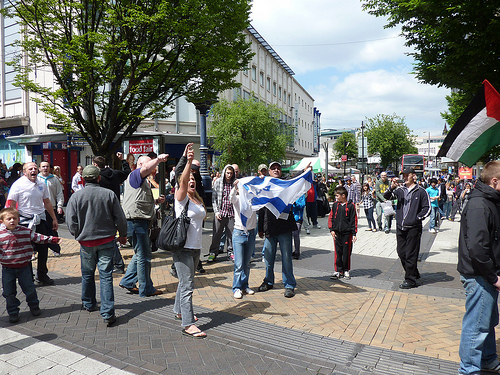 The EDL attacking Birmingham PSC stall - with Israeli flag giving the Hitler salute! SNP MPs - Friends of Palestine and Friends of Israel? For those who have illusions that the SNP is a left-wing, progressive party, the post below should be an eye opener. Yesterday I received a copy of Early Day Motion 652 ANTI-SEMITISM AND PALESTINE SOLIDARITY which clearly originated with the SNP. Of the 33 MPs who have so far signed this motion, 28 are from the SNP, 2 from the Labour Party, 1 from the Tory Party and 2 from Northern Ireland’s SDLP. 1. It couples anti-Semitism and Palestine solidarity together and assumes that there is a linkage. 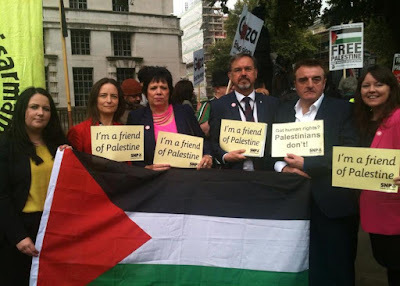 In fact there is no evidence whatsoever that the Palestine solidarity movement in Britain has, or ever has had, any connection with anti-Semitism or anti-Semites. 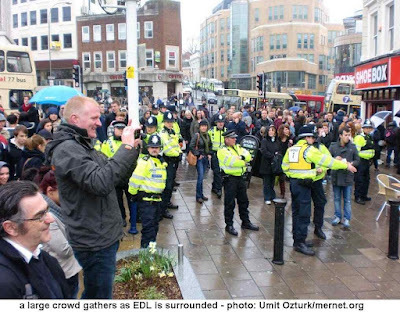 The connections with anti-Semitic and holocaust denial groups have been between the Zionist movement and the English Defence League and British National Movement. 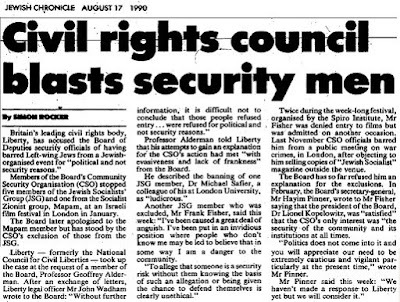 In 2012 Palestine Solidarity Campaign at its annual conference voted to expel a holocaust denier, Frances Clarke-Lowes from National PSC (Brighton PSC had already done so locally) and to make it clear that Paul Eisen's Deir Yassin Remembered had no place in the Palestine Solidarity Movement. 2. The Community Security Trust that the SNP EDM quotes is an overtly far-right Zionist group, which sees its role as ensuring that the Jewish community remains free of anti-Zionist influence. 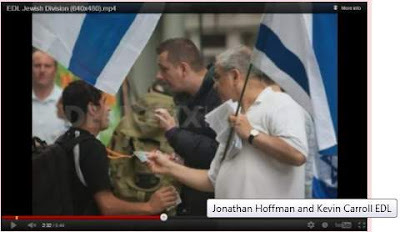 It has close links to Israel’s Mossad (MI6) and keeps copious files on Jewish activists. 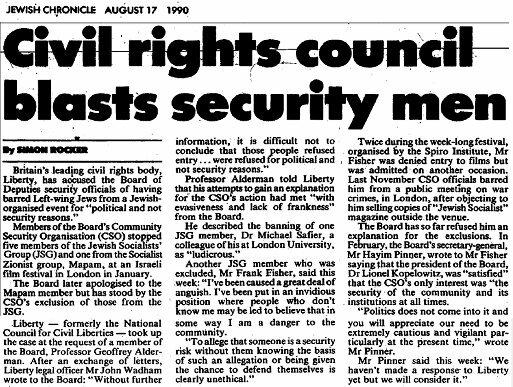 Its predecessor the CSO was criticised by Liberty for having barred 5 members of the Jewish Socialists Group from a Jewish communal event solely on the grounds of their political viewpoint. As my letter to the signatories of the EDM makes clear the CST play fast and loose with the definition of what constitutes an anti-Semitic incident. 3. The EDM claims that the biggest ‘the single biggest contributing factor [to the doubling in anti-Semitic incidents in the UK] to have been anti-Semitic reaction to the armed violence between Israel and Gaza in July 2014.’ If that is true then it also means that some people in Britain associate Israel’s genocidal attack on Gaza with Jewish people in Britain. Why might that be? One reason could be Israel’s claim to be a Jewish state which acts on behalf of, not only its own Jewish citizens but Jews worldwide. Another reason might be the fact that the Board of Deputies repeatedly comes out with statements and organises demonstrations and pickets, as it did recently outside t he Palestine Mission in London, supporting Israel’s attacks on the Palestinians. Anti-Zionist Jews in Britain took to demonstrating outside the BOD offices in London during Operation Protective Edge claiming that they don’t speak on behalf of us. Is it any wonder that some misguided people then hold individual British Jews responsible for what Israel does? That is not the fault of anyone in the Palestine solidarity movement but the Zionist movement. The SNP MPs should direct their attention in that direction. 4. The suggestion that our criticism of the Israeli state and its policies spills over into ‘group-blame or racist stereotyping’ is simply a lie and we challenge the SNP MPs to provide one example. I am writing to you because you have signed an Early Day Motion on anti-Semitism and Palestine solidarity. Although it may be well intentioned, the EDM is both misguided and wrong. The EDM notes the doubling of anti-Semitic incidents across the UK in 2014, as recorded by the CST. The CST’s statistics are not reliable and neither is the information they distribute. What they didn’t publicise was that the Upper Immigration Tribunal overturned this decision on appeal. ‘The principal source for the decision to ban him, … was a report compiled by the CST. Almost a year on, all four charges against Salah, supporting his deportation, have been thrown out by the vice-president of the Upper Immigration Tribunal. In his ruling, Mr Justice Ockelton said May was misled and "under a misapprehension as to the facts"…. The CST's confidential advice to the home secretary was accompanied by a well-orchestrated and poisonous campaign against Salah in the media, who so swiftly and conclusively condemned him as a "hate preacher". 2. 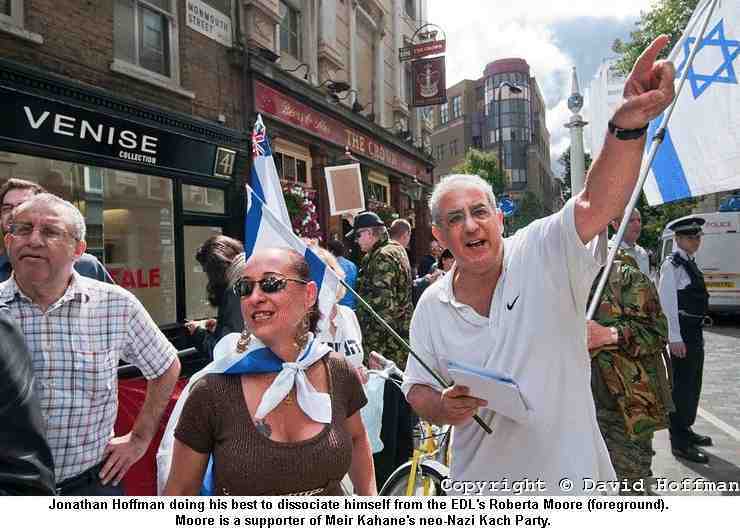 The CST is a far-Right Zionist organisation bankrolled by Gerald Ronson, a right-wing industrialist. It has a political agenda and is vehemently anti-Palestinian. When I received two posts at my blog, one denying the holocaust, the other expressing a desire that my family and myself had perished at Auschwitz, I filed a complaint. The CST determined that the former post was anti-Semitic but not the latter – because it was posted by a Jew (& Zionist). 3. The EDM ‘affirms that anti-Semitism has no place in campaigns of solidarity with Palestinians’. This presumes that anti-Semitism has ever had a place in the Palestine solidarity movement. This is wholly untrue. Indeed the main bastion of support for Israel and Zionism lies on the anti-Semitic far-right of British and European politics. 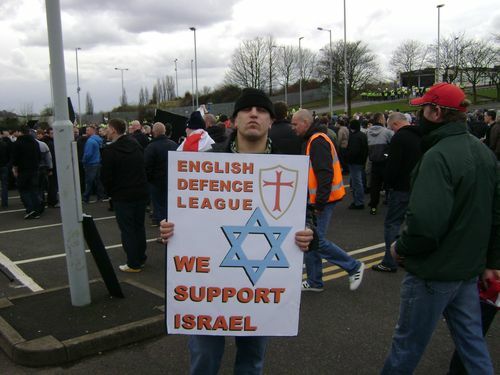 Both the BNP and EDL are ardent supporters of Israel and its attacks on Muslims. 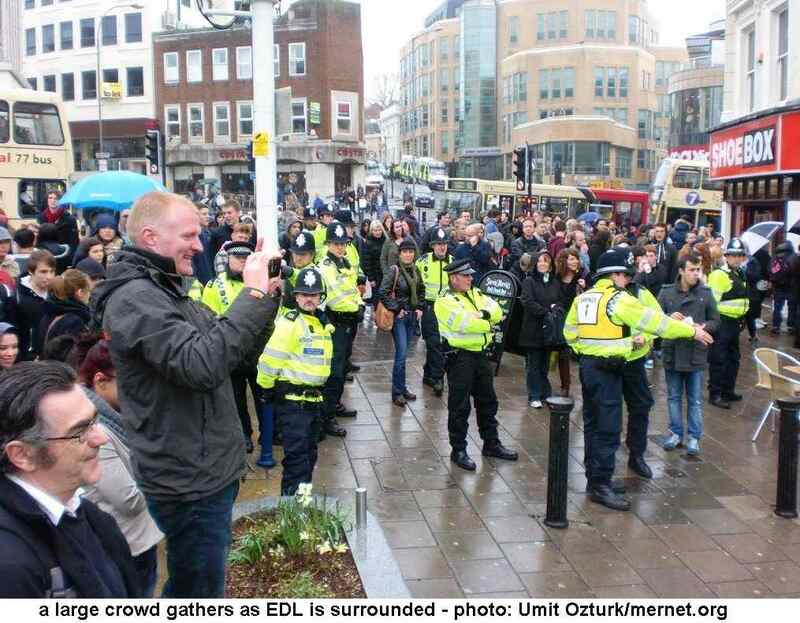 The EDL has attacked a number of Palestine events. 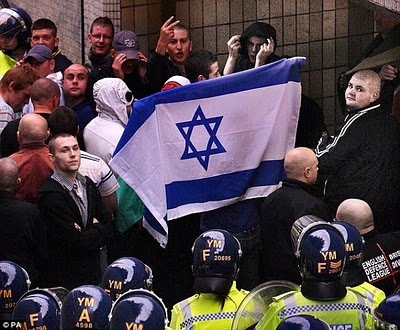 In Birmingham theyattacked a PSC stall displaying an Israeli flag in one hand and giving Hitler salutes with the other! 4. The EDM states that ‘violence between Israel and Gaza’ in July 20014, in fact an unprovoked attack by a military superpower on a civilian population, when over 550 children died, produced a rise in anti-Semitic incidents in Britain. The reasons for this should be obvious. Israel claims its actions are those of a ‘Jewish’ State and that they are carried out on behalf of all Jews, not merely its own Jewish citizens. Even worse, the Board of Deputies of British Jews has repeatedly organised demonstrations and issued statements supporting the attacks on Gaza. 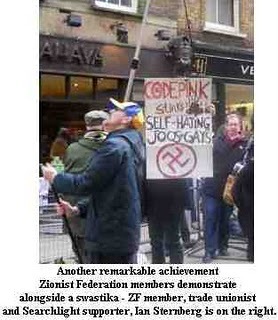 In August 2014 a group of British Jews held a demonstration outside the Board’s offices ‘BritishJews Against Genocide Protest Outside the Offices of the Board of Deputies of British Jews’ protesting at the fact that the Board deliberately associates the Jewish community in Britain with Israel’s murderous attacks on the Palestinians. The Board of Deputies deliberately makes British Jews targets for those angered by Israel’s actions. It is not surprising that some people take the Board at its word and then attack individual Jews. However such attacks have nothing to do with the organised Palestine solidarity movement and your strictures would be better directed at those who are primarily responsible for associating British Jews with Israel’s actions. We agree that people should not ‘group blame’ Jews for Israel’s actions, however your words would be better directed at those responsible. As currently worded, the EDM is directed at the wrong target. In so far as there has been an increase in anti-Semitic incidents as a result of Israel’s genocidal and racist behaviour, these are random attacks by individuals who have nothing to do with the Palestine solidarity movement.